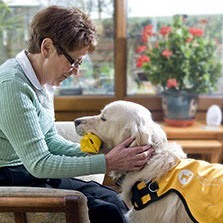 The first trial to develop the use of dementia dogs to support families living with dementia has proved so successful that the scheme is now to be expanded. Starting life as a collaboration between Alzheimer Scotland, The Glasgow School of Art, Dogs for the Disabled, and Guide Dogs UK, the project selected a number of dogs as potential candidates in April 2013 to begin a small scale trial at the Guide Dogs for the Blind training facility in Forfar, Angus. 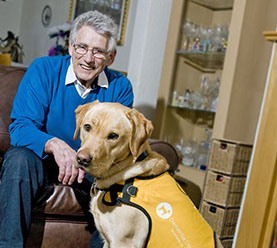 The challenge was to measure the effects that trained assistance dogs could have in supporting families living with the challenges that dementia brings. 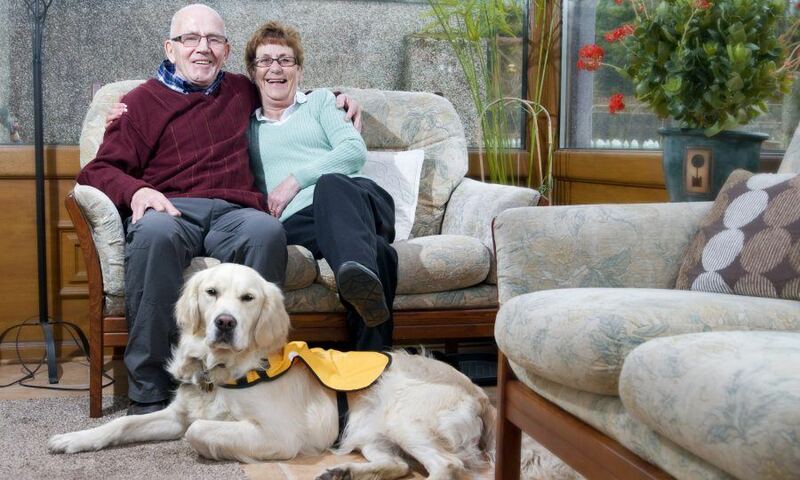 After an initial training programme, four dogs were carefully matched with families in Angus and three have gone on to live as fully qualified dementia assistance dogs with individuals with dementia and their carers. Oscar, one of the first dementia dogs in the world. Oscar was chosen to live with Frank and Maureen Benham. His effect on Maureen, who had been diagnosed with early-onset Alzheimer's 5 years previously, was almost immediate. One of the first things I noticed with dementia was my wife lost her communication skills, Frank explains. One day I heard Maureen talking in the other room and I wondered what was going on. She was chatting to Oscar. He brought her out of her shell. People would also stop us in the street to see Oscar and we would end up chatting. Maureen passed away in May and I couldn’t live without Oscar now – he gets me out of the house every day. I still take him to the care home where Maureen stayed towards the end and everyone is glad to see him. He seems to bring joy and that makes my day as well. I feel like I’m giving a little back. But as well as bringing joy and cheer, the aim of the trial had much wider goals ..." to prove that dogs can help people with dementia maintain their waking, sleeping and eating routine, remind them to take medication, improve confidence, keep them active and engaged with their local community, as well as providing a constant companion who will reassure when facing new and unfamiliar situations." "A﻿﻿s well as the social impact he had, Oscar was trained to do various things to help", explains Frank. For example, when Maureen’s alarm went off in the morning he would go through to the bedroom, put his feet on the bed and shake it to get her up. We also had a buzzer go off for her medication and he would go through to the kitchen and pick the medicine up, which reminded me. And when we went shopping I could sit Maureen down and I knew he would anchor himself there and not move, allowing me to take my time going round the supermarket without having to worry. The team were keen to select families living close to Forfar so that they could be supported by regular communications and visits from the Dogs for the Disabled team trainers and by Alzheimer Scotland local staff. Assistance dogs are obviously a huge commitment and the project has been careful to track the progress of the participating couples and their canine companions. "It only works if the dog goes into a home where there is a partner. The person with dementia wouldn’t remember to feed the dog or to take them out." points out Frank. Oscar continues to live with Frank providing him with comfort, stability and a ‘reason to get up in the morning'. The project team stress they will be able to stay together as long as they are both happy with the arrangement. Kaspa, one of the other dogs in the trial has similarly transformed the lives of Glenys and Ken, to whom he was paired. “Kaspa has given us our life back, says Glenys. He greets Ken in the morning, so starts Ken’s day being happy. I have noticed if Ken is agitated or unsettled Kaspa gives him a nudge so Ken talks to the dog or goes out in to the back garden and forgets what had bothered him. Kaspa has removed my fear that Ken had gone, life is so much better for both of us now. Ken is happy and it has taken so much stress away from me as well." The success of the trial resulted in a substantial funding award from Life Changes trust in August 2016. 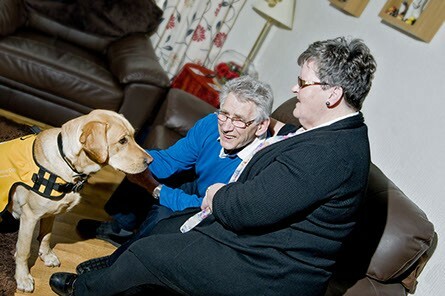 This has enabled the expansion of the Dementia Dog programme with a further 8 dogs now being trained, and ways of supporting families who cannot have a dog full time being explored.